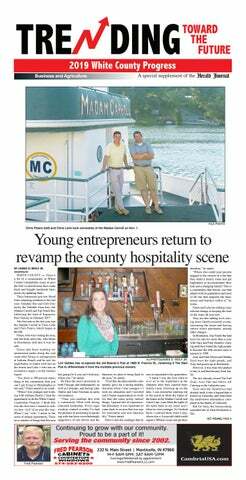 Young entrepreneurs return to revamp the county hospitality scene Chris Peters (left) and Chris Lehe took ownership of the Madam Carroll on Nov. 1. BY JAMES D. WOLF JR.
HJ PHOTO/JAMES D. WOLF JR.
Lori Geldes has re-opened the old Beaver’s Pub at 1868 N. Francis St., renaming it The Dam Pub to differentiate it from the multiple previous owners. Area business and industry leaders attended the White County Economic Development’s annual lunch last month at the Brandywine Conference Center in Monticello. Randy Mitchell, president of White County Economic Development, welcomes area business leaders to WCED’s annual lunch Friday at Brandywine. heard of us.” KOA maintains a standard of excellence in unique outdoor adventures and hospitality across 517 locations throughout the U.S. and Canada. “The Indiana Beach/ Monticello KOA is the perfect addition to the KOA family of campgrounds,” said KOA President Toby O’Rourke. “The outdoor experience offered at this campground is exactly what our guests have learned to expect from KOA.” The campground officially opens this May, but guests can begin booking their stay now through indianabeach. com/camping. Andrew Westfall, agriculture and natural resources educator for Purdue Extension of White County, explains to the Kiwanis Club of Monticello last summer how the use of unmanned aerial vehicle technology — commonly called “drones” — will help area farmers keep an eye on their crops. for farmers contemplating investment in drone technology for their farms. “I have also been helping other educators at Purdue develop a training course that would help prepare people who are interested in obtaining their FAA license,” he said. Westfall has his Part 107 pilot’s license to fly the UAV, which is registered with the Federal Aviation Administration, as is required. Studying for the license consisted of taking an online course and reading a study guide provided by the FAA. Westfall said flying the UAV is part of an effort to help area farmers meet the demands of technology in agriculture. He will co-present a program March 13 at the Soil and Conservation District’s annual meeting on how drone are impacting and monitoring conservation efforts in Indiana. “That morning, we will also have Purdue’s Digital Ag Trailer, which will allow attendees to gather around some TV monitors and view a live feed of a drone in flight, weather pending,” he said. CONTINUING THE TRADITION OF SERVING THE FAMILIES OF WHITE COUNTY AND SURROUNDING COMMUNITIES CONTINUOUSLY FOR OVER 139 YEARS. “Construction Solutions for the Future” Titan Construction & Engineering Services has been providing design/build general contracting services since 1979. Our in-house engineers and facility planners can provide engineering assistance to you and your staﬀ for all areas of construction. Titan Construction can provide for your construction needs, from the simple to the complex. Fantastic Service • Quality Products • Superb Installations • FREE Estimates! families starting in early November. “We take applications for volunteers through our website: whitecountyunitedway.org and then try very hard to match our volunteers and their skills to the correct project or program,” Jenkinson stated. “We may need office support, or we can connect interested employers with employees by way of internships and flexible learning opportunities.” As she has settled into her second year of her position with United Way, facilitating research to help FILE PHOTO make ends meet in the community…”It’s been an honor to serve United Way Executive Director Nickie Jenkinson took her turn the population of White County,” walking the room for auction item bids during the United Way cruise on the Madam Carroll Jenkinson concluded. HJ PHOTO/ JAMES D. WOLF JR. The Top Notch Bar in Brookston has been sold, and the owners since 1990, Pam and Gary Hendryx (background) have passed the baton of the well-known 1958 bar and grill on to (foreground, l to r) Maliha Syed, Amy Morris and Alan Morris. Nick Blum is one of the new owners of Oakdale Dam Inn – soon to be Oakdale Bar and Grill – along with his childhood friend, Dewey Brown, and Dewey’s wife, Nicole Brown. so Although there’s not a lot in the town, people eat locally and support the businesses. “I’m happy we don’t have chain restaurants here,” she said. Except for deep cleaning, the only major change Geldes made was to give it a new name, The Dam Pub. Beaver’s had opened and closed under a few names over the years. “It felt like it needed a new name,” she said. Geldes plans to keep the atmosphere of a bar and grill, but she plans changes over time. That includes game nights (cards and a dart league), menu specials and in the further future, a patio. Rudy and Salina Vargas, of Valparaiso, were looking for a cottage to visit in 2012. She discovered that Anchor Bay Resort at 2373 N. Untaluti St. While fixing the cottages up, they went to eat at Sayler’s Bar at 4986 E. White Point Dr. and found it was up for sale. Salina said in April that she talked to owner John Salyer and 20 days later, “I looked at my husband and said, ‘I bought the bar.’” Then in January 2018 after a lot of caution, they bought the restaurant at 1210 N. 6th St. that was once known as BJ Wingers and Double D’s, turning it into Rugie’s Dugout. Photography artist JD Dennison stands by his photo of one of the dairy cows at Fair Oaks Farms. The photo is on display in the executive suite at the new Fairfield Inn & Suites at Fair Oaks. entrance with his multilayered abstract interpretations of life on the farm. J.D. Dennison is a photographer, but his works are of a different style. He inverts the photos so they are negatives that bring out different colors and unique perceptions. R. Tom Gilleon has had his work on display at the Farm for more than 10 years, and his “saturated surrealism” graces the walls of the pool at the hotel. Dr. Bill Hogan, vice president for advancement of the Phoenix Project St. Joseph’s College, spoke to the guests as well. “We have come back; we will come back,” he said, referring to the college. He thanked McCall and the economic development directors for both Jasper and Newton counties for their efforts to keep the college going. McCall said the Marriott company allowed Fair Oaks to change a few things that aren’t part of their standard buildings or the standard art that goes into their Fairfield Inns & Suites. The silos offer a different look to the building and the art reflects the agricultural community that surrounds Fair Oaks Farms. Center, as well as Disney parks overseas. He said he had just finished the Shaghai Disney not long ago. He and his wife moved to Montana and he switched styles from illustrations to fine art. When illustration became digital at the beginning of the century, he worked with Pixil. The artwork in the pool, a large mural, comes from a digital illustration transferred to small tiles as a mosaic. Hogan said the artists had been very generous. “We’re very pleased with everything at Fair Oaks Farms, as they expand and grow, SJC will expand and grow,” he said. “This is exciting for Newton County,” said Tim Myers, Newton County Economic Development director. In September, the Indiana Economic Development Conference will be at Fair Oaks Farms. The two directors, Myers and Stephen Eastridge, of Jasper County, were able to bring the conference to the area away from central Indiana. Get your message to all your potential customers! Your only source to reach over 17,000 White & Carroll County households every Monday in the Weekly Reminder. Now with expanded coverage – mailed to every Monticello household! Over 70,000 Page Views Per Month! New planning rules look to county’s future BY JAMES D. WOLF JR.
WHITE COUNTY — With new development comes new situations and new laws. And White County Area Plan’s office and commission have been working on three new types of ordinances that should direct the county’s future. A demolition ordinance has already passed this year. Under it, those planning to do a commercial or industrial building removal must first apply for a permit or prove they don’t require the permit under the new ordinance, said White County Area Plan Executive Director Joe Rogers. The reason for the permitting has to do with situations like the old hospital property in Monticello, he explained. Years ago, after IU Health purchased the hospital, it moved to the building on Sixth Street on the southwest side of town. A firm that purchased the former hospital only gutted it for salvageable materials, such as the metal water pipes, Rogers said. That created a building that was useless and needed too much work. “It just leaves a mess in the hands of those left with it,” he said. A permit would require a plan for total demolition. “This is a process that will ensure that wouldn’t occur,” he said. Another potential problem exists with the iron ore pellet plant in Reynolds that’s been abandoned. The plant and not the land was sold to a Mexican company in bankruptcy proceedings held in Minnesota. “You’ve got certain situations like that where nobody can predict what will happen to a business,” Rogers said. Situations like the burned out motel on U.S. The iron ore pellet plant outside Reynolds has been bought in a bankruptcy sale, but rumors are that it is being dismantled and taken to Mexico by the buyer. stapled to utility poles, and there are new laws nationally governing signage. That includes a Supreme Court ruling two years ago that “content signs,” such as construction signs and political signs on lawns, cannot be handled differently than other signs. The process for revamping the sign ordinance is still very young, Rogers said. To get matters precise, they just started a committee to develop a methodology on how to work on the ordinance and be extremely thorough. “It’s going to be a long process. We’re going to kind of micromanage that, take it section by section,” Mitchell said. The 2018-2019 Kiwanis Club of Monticello officers were sworn in Monday night, (front, l to r) President-Elect Larry Crabb, Treasurer Barbara Bedrick, new President Jerry Danner and (back) Secretary Mike Rice. HJ REPORTER/JAMES D. WOLF JR.
Indiana state Rep. Don Lehe (R, District 25) is shown speaking at the podium at Saturday’s Third House at the Monticello-Union Township Public Library. 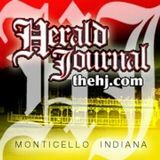 He and Indiana state Sen. Brian Buchanan (R, District 7), who’s seated at the table, talked with residents about pending legislation and constituent concerns at the Monticello Kiwanis Club-sponsored event. Faithfully Servicing Our Members for over 60 Years! Rachel Brandenburg (left) and Connie Milligan, of Impact Ministries, recently talked about their trip to Guatemala. They were the featured speakers at Monday’s Kiwanis Club of Monticello weekly lunch meeting. Impact Ministries train others for leadership by teaching biblical principles. It offers opportunities for North Americans to support Christian development through Child Sponsorship, Short-Term Missions, and several giving programs. For more information visit www.impactminusa.org. Lowest Rates in Town! Where you can get more for less! Lynn Saylor, local coordinator for United Against Opioid Abuse, spoke at the Monticello Kiwanis Club on Monday about opioid abuse in White County. Monticello Parks Superintendent Mitch Billue receives a $4,000 check from the Monticello Kiwanis Club for the Kiwanis garden and sitting area at Altherr Nature Park. Monticello Kiwanis Club members stand alongside the benches that the organization had received, including the five purple ones in remembrance of the two recently deceased Twin Lakes High school students, Faith Dold and Anahi Garcia. Pictured, from left, are Kiwanis President Jerry Danner, Kiwanis Secretary Mark Rice and Twin Lakes High School Key Club Sponsor Barb Alletto. offer,” she said. She met people through Kiwanis that she HJ PHOTO/JAMES D. WOLF JR. hasn’t met elsewhere in the community, she Indiana Patriot Guard Ride Capt. Scott L. Allen, of Reynolds, told the Montiadded. cello Kiwanis Club on Monday about all his organization does for veterans. The group seems a good fit for White Oak, and she also liked the organization’s focus on youth. “Children are where it starts,” she said. Anyone interested in becoming a Monticello Kiwanis Club member can talk to any of the club members. That includes when they’re at special events such as the club’s May 18 annual Pork Chop Dinner and the June 22 annual Pancake Breakfast. Or they can join the Kiwanis at noon on Mondays at Best Western Brandywine Inn for the weekly luncheon and speaker. We offer the highest-speed internet services for all your web needs - from streaming movies and audio to gaming and skype conversations, internet and e-mail services. We provide clear, reliable,and affordable communication services for businesses and residential customers in the (219) 253 prefix. We offer local dial tone service and long distance at competitive prices and unsurpassed clarity. Twin Lakes High School earth and space sciences teacher Jill Gilford (above) has been brining training through NASA to her classroom since early 2017. On Monday, she brought her training suit and badges (below) for the Monticello Kiwanis Club members to see. We’ve Got Your Family and Business Covered • High Speed Internet • Co-op Connections® Discount Card • Exclusive Water Heater Program • Energy Efficient Rebates • And Much More! Business and upward trends coming in 2019 for White County, Indiana.